McCain just announced today that he won’t be present for the vote (in fairness, neither will Hillary, and Obama isn’t certain he’ll be able to attend). While Clinton and Obama have pledged their support for the Lieberman-Warner Global Warming Bill, even if they can’t show for the vote, Senator McCain has declared that even though he can’t attend the vote, he would almost surely vote no on it. Of course, that was three weeks ago, and trying to follow McCain’s careening positions is like trying to follow a hockey game with a head full of barbituates and cheap wine. It’s disorienting, too fast to follow, and by its frenetic pace inevitably induces nausea. He could have been forgiven if he’d come out initially against the bill. If you spent any time looking at his voting record, he’s come down against renewable electricity standards and renewable production tax credits, and he has a zero percent rating from the League Of Conservation Voters. With that kind of record, even poll-reactive rhetorical claptrap is a step up. Of course, he doesn’t mean it, but at least he’s pretending to, and he used to not even do that. In 2007, he missed every critical environmental vote in the Senate. Also when he urged “the entire Congress” to support the bill, he almost certainly wasn’t including himself in that body. “The people of Arizona understand that I’m running for President.” Therefore, I’ll be almost entirely unable to fulfill my job as one of this state’s two elected Senators. Granted, of all the votes cast by the 110th Congress, Senator Clinton missed 31.8% of 579 possible votes, and Senator Obama missed 41.8%. John McCain missed 60.1%. Obama’s missed votes are no small affair either, but he still managed to cast 106 more than McCain, and he was there on the most important bills, and, unlike McCain, he managed to log more votes than Senator Tim Johnson of South Dakota, who spent much of the year recovering from a brain hemorrhage. McCain managed one impressive phase where he racked up 42 consecutive absences. The people of Arizona might understand that he’s running for President, but a number of his missed votes occurred before the Presidential campaign began in earnest. Last year, he was the only Congressional Presidential candidate to miss any of 14 critical Iraq votes through May. McCain has proven loyal to his President with the sub-Nixonian approval ratings–and the one who attempted to destroy him in South Carolina in 2000. 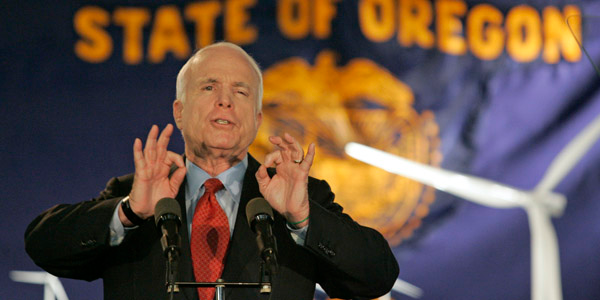 Congressional Quarterly reported that McCain has voted 100% of the time with George Bush in 2008 and 95% in 2007. One of the few votes he’s managed this year was a no vote on the torture bill, just a few short weeks after he indignantly took Mitt Romney to task for his naivete if he truly didn’t believe that waterboarding was torture. Many of his absences have been notable by their conspicuousness. When the White House was pushing its tepid economic stimulus bill earlier this year, the Democrats and several Republicans were attempting to push through a more robust bill and needed 60 votes to invoke cloture. Their effort failed 59-40–and Senator McCain was the only member of the Senate to not even show up for the bill. Just last week he was one of only three Senators to not even bother to show up for the GI Bill, which passed the Senate 75-22. It looks like 2008 isn’t going to help McCain’s numbers much. He’s missed 57 of the last 58 Senate votes this year, and if he hadn’t bothered to show up in the Washington D.C. on February 12-13 and March 13-14, where he managed in his hit-and-run visit to his place of employment to cast a whopping 32 votes, he would only have three votes all this year. So far for 2008, most of which he’s spent waiting for an opponent for his Presidential campaign this fall, he’s managed to miss exactly 75% of the 137 Senate votes taken so far. Senator Obama, by anyone’s estimate having a bit of a busier campaign than McCain, has managed to show up for 45% of all votes this year, while Hillary has been present for 42.8%.